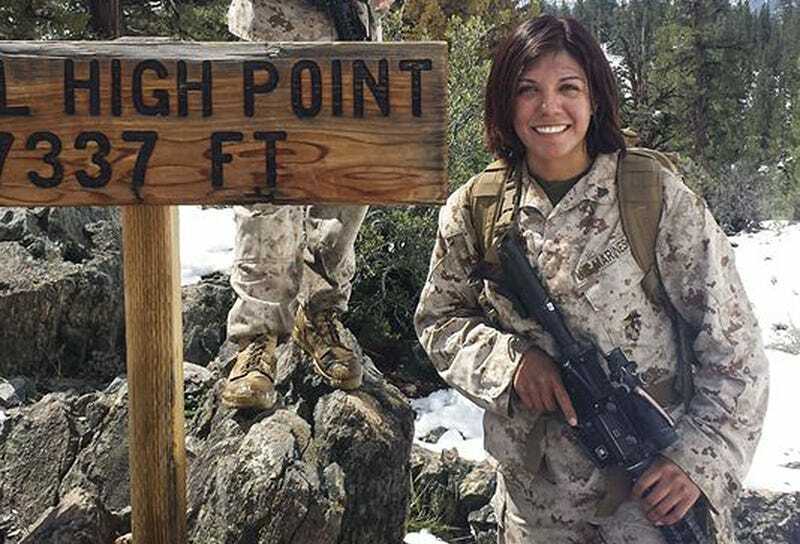 Corporal Remedios Cruz, a 24-year-old supply clerk and a graduate of Marine Infantry School is one of half a dozen other female Marines who took part in an experimental program that put men and women together executing combat tasks. Now, with all U.S. military jobs opening up to women, she could be the USMC’s first female Rifleman. Her experience taking part in the integration study has given her a new appreciation for what it takes to join the infantry, she said. The long hikes were the toughest part of the training for Cruz. She and the other Marines marched up to 20 kilometers while carrying between 80 and 85 pounds of gear. They trudged through soft sand at the Marine Corps Air Ground Combat Center Twentynine Palms in 100-degree weather. Cruz and her handful of fellow female Marines who took part in the test are not the only women in the Corps who want to take on a direct combat role. But there is controversy, and it has to do with the specter of lower standards for female applicants. This is obviously a huge deal for any combat unit, especially for one as demanding as what Marine Grunts experience in the field. Another larger-scale combined-gender combat study occurred this summer that supposedly showed somewhat damning evidence that mixed-gender units fared far poorer in intensive drills than all-male ones. You can read all about this study here and come to your own conclusion as to if it was a fair test or not, one thing is certain though, it looked at the group not the individual. Regardless of the results of tests and war games, the times they are a chaingin’ in the USMC, there is no doubt about it. But just like every ethnic or gender barrier that was taken down over centuries long existence of the U.S. military, this one will make the services stronger in the long run, not the other way around. Still, the Pentagon should be extremely careful when it comes to lowering standards for anyone, male or female. This historic move to finally integrate women into combat roles could be ruined by the Defense Department itself if it does not stick as close as possible to one rubric for everyone. Quotas and other artificial structures should be pushed aside, and an applicant’s total package of skills, physical abilities and experience should be evaluated without gender specification. Yes, this means that some women may have a physical disadvantage for certain positions. Yet all this means is that the women who pass the same criteria as male applicants will enter their combat roles on a level playing field and it will deflate arguments against women in combat. This topic is becoming especially contentious among America’s elite special forces, who have the most stringent physical demands in the U.S. armed forces. In the meantime, the debate on this issue is roaring away within the Pentagon’s five walls. Just yesterday, one of the USMC’s top Generals bemoaned the process and especially the pressure to lower standards. We will have to wait and see exactly how the Marines will deal with this situation. As for Corporal Cruz, it sounds like she is one focused, capable and vetted individual, and she wants to fight. Give that woman an M-16 and unleash her on the enemy already!